I was asked to work a sample up for PattyB over at Splitcoast for her Hope You Can Cling to Challenge. The challenge was specifically to use the Serendipity technique to create a pink collage. Go here to see the master challenge thread. I have to say that I LOVED Serendipity! Instead of using a neutral piece of cardstock, i.e. not dsp, I used a sheet from the First Edition dsp as my base. For my collage, I took the bee and the bird from Nature Walk and the flourish from Established Elegance. 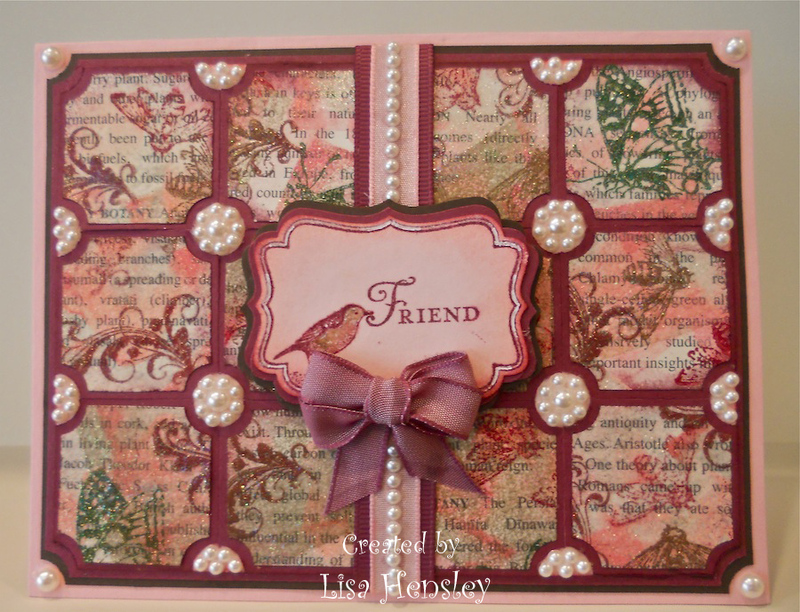 I first did some direct to paper with Pretty in Pink and Regal Rose craft spots onto my base, then randomly stamped my images in Garden Green, Rich Razzleberry and Versamark. In between stamping, I would periodically stop and sprinkle either Gold, Clear or Iridescent Ice ep over the whole thing, gradually building up the layers. When I thought that I'd achieved enough depth and texture, I cut my sheet into squares using my 1 1/4" square punch . I notched the corners of 12 squares with my Ticket-Corner punch, then sponged the edges with Rich Razzleberry. These I layered with pieces cut out of Rich Razzleberry with my 1 3/8" square punch, also notched on the edges. The collage pieces were adhered to Pink Pirouette, then pearl "rosettes" fitted into the round spaces between the collage pieces. The bird frame from Four Frames was clear embossed and watercolored. The edges were sponged with Pretty in Pink and Rich Razzleberry and the "points" of the frame highlighted with white gel pen. All products used were Stampin' Up!